It's starting to become a rerun of your least favorite show, yet you have no choice to watch and hope the outcome magically turns differently. That's what it's like watching Philadelphia's offense right now. It's a tired act that seemingly never ends. The bats were silent again on Wednesday in a 7-2 loss to the Rockies at Citizens Bank Park. Two solo home runs, one from Jorge Alfaro and another from Jesmuel Valentin accounted for the Phillies' offense. The Phillies are hitting a league-worst .208 over the last 30 days matched with a league-leading 27-percent strikeout rate. Through a tantrum and go on a tirade? That's one option for manager Gabe Kapler and who could blame him, but that's not his plan of action, at least not yet. "I don't know if me getting frustrated will be helpful for our hitters," Kapler said afterward (see video). "I'm not going to display frustration to them. I'm certainly riding this with them. I'm right by their side, as are all of our coaches." 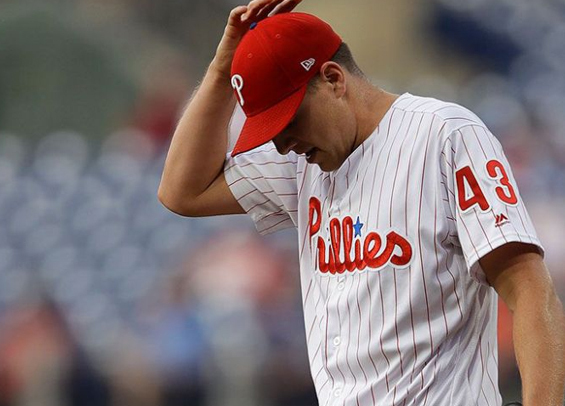 Compounding matters on Wednesday was another sub-par outing from Phillies' hurler Nick Pivetta who was hit around to the tune of six runs on eight hits over five innings. Like the offense, he too has hit the skids. carrying an 8.36 ERA over three outings since the start of June. "I think the biggest thing is I got behind in the counts," Pivetta said afterward. "I didn't execute pitches the way I was in previous innings, and they're a good hitting club. I'm going to go back out there, work on what I need to work on, and come back with a better mindset." Pivetta threw 91 pitches on the night, 56 for strikes. He struggled with command and had difficulty locating his pitches, particularly his slider and curve. "I think the breaking-ball command is one that is worth looking at," Kapler said. "I also think Nick is the kind of pitcher where if he gets ahead in the count, he's deadly. He gets behind in the count, and hitters get better swings on him. They see his fastball a little bit better and breaking balls that aren't located well, they get on top of." The lone bright spot on the night belonged to Valentin, who hit his first career home run with a blast that scraped the metal fence before leaving the yard. It was amazing," Valentin said (see video). "When I hit it, I knew I had a chance, just because the wind was blowing out a little bit today. I saw a couple balls flying out. So as soon as I hit it, I thought I had a chance. But I saw Gerardo [Parra] trying to get under it a little bit and I got a little bit scared, but I'm glad I got it out of the way." The two clubs conclude their three-game set on Thursday afternoon. Vince Velasquez will take the mound for the Phillies. The Rockies counter with righty German Marquez.